Blast to the Lonely Mushroom is a mission of Tall, Tall Mountain. In Super Mario 64, it is the sixth and last mission of the course, though in Super Mario 64 DS, it is moved to the fifth mission. 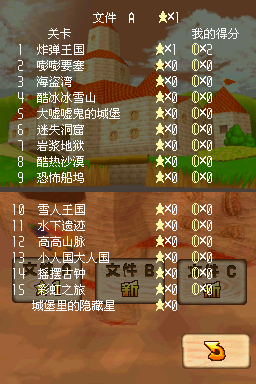 In order to reach the Power Star, the player needs to open the cannon if they haven't already. The player needs to climb the mountain until the get to the wooden bridge past the Chuckya. Just after the bridge on a platform below is the course's Bob-omb Buddy, and talking to him will open up the cannon. To get to the cannon, the player has to go to the mushroom platforms just before the Monty Moles. Stepping onto the smallest mushroom in the center will warp the player to an area under the mountain. Crossing the narrow paths ahead will lead the player to the cannon. 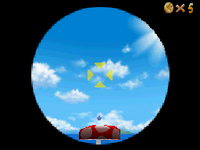 Once in the cannon, the player needs to line up their angle at the mushroom with the Power Star in the distance, roughly that of the angle shown in the picture to the right. If the player thinks they have the correct angle, they need to fire over to the platform to collect the Power Star. Aside from the cannon, other methods are possible, such as using a Crazed Crate, as well as Hoot in the DS version. Tobe! Hanare kinoko e Fly to the Isolated Mushroom! This page was last edited on March 17, 2019, at 16:55.